Stems: Erect, numerous, stiff, slender, 4-sided, leafy, branched, short grayish-hairy, arising from thick, woody crowns. Leaves: Opposite, simple, short-stalked or sessile, egg-shaped to elliptic, 1/3 to 1/2 inch long, 1/4 to 1/2 inch wide, short grayish-hairy; margins entire; tips rounded; upper leaves reduced. Inflorescences: 2 flowers per node in leaf axils of upper 1/2 of plant. Flowers: Calyces 2-parted, short-hairy, resin-dotted; corollas 2-lipped, 1/2 to 3/4 inch long, deep blue or purple, white patches on lower lip, minutely hairy; stamens 4, under upper lip. Fruits: 4 nutlets, dark, covered with pimple-like bumps, each 1-seeded. Habitat: Dry upland prairies on rocky or sandy limestone soils. Distribution: North-central and west-central Kansas. 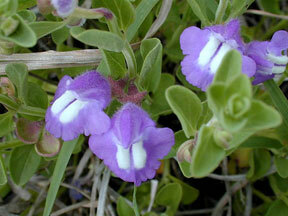 Comments: The common name comes from the flower's resemblance to a priest's cap or a helmet-like head covering.